Sky Bet might be an interesting inclusion into my top 6 bookmakers for placing accumulator bets. They are definitely the youngest and probably least experienced out of the group, but I think that they offer a really solid alternative, especially as a lot of you will already have accounts on the bigger brands. 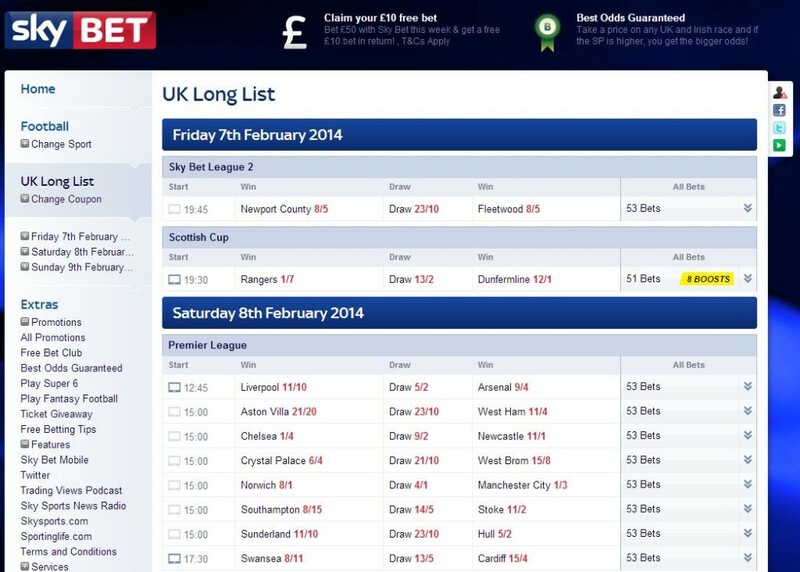 1) You’re going to need an account with Sky Bet before you place any bets. If you don’t have one then you can click this tracked link and claim a £30 free matched bet. 2) Second part is to fund your account. This will just take a couple of minutes and can be done by clicking the account button at the top of the screen. 3) Once you’ve found which bets you want to include into your acca, then simply click on the odds for that bet to add them. They will then be included in the bet slip at the bottom of your page. 4) The bottom of your bet slip will include an ‘accumulator’ bet showing your odds for your picks. Then simply enter your stake and click the bet now button. One last thing! If you don’t have a Sky Bet account remember that by clicking this exclusive tracking link, you will be eligible to get a free bet with up to £30. What’s drawn me in to Sky Bet is the constant barrage of promotions they seem to be willing to throw at their customers. But what I was really impressed with is how many of these promotions are available for existing customers. One of my pet hates is that many bookmakers, once they have you signed up, simply forget about you, but Sky Bet definitely buck that trend. You can find more out about the company in my Sky Bet review. In an industry that’s dominated by a group of around half a dozen or so ‘big guns’ it was always going to be interesting to see how Sky Bet managed to get on. One of the routes they took is providing customers with new markets, or at least they thought they were new. Sky Bet showed people that to bet on an accumulator you didn’t just have to have the same old outright winner markets. It was possible to include a huge range of interesting markets that often got overlooked. The inclusion of a goal frenzy coupon, both teams to score, bankers coupon, over/under goals markets, super 6 and many more have propelled them to accumulator stardom. I will be honest and say that Sky Bet aren’t my most frequently used bookmaker, but when I fancy something a little bit different, they are who I turn to pretty much every time. As ever, before placing any bets you will need an active and funded betting account. With Sky Bet you can actually get £5 completely free for just opening account. You can find out more in my Sky Bet review or how to open a Sky Bet account article. 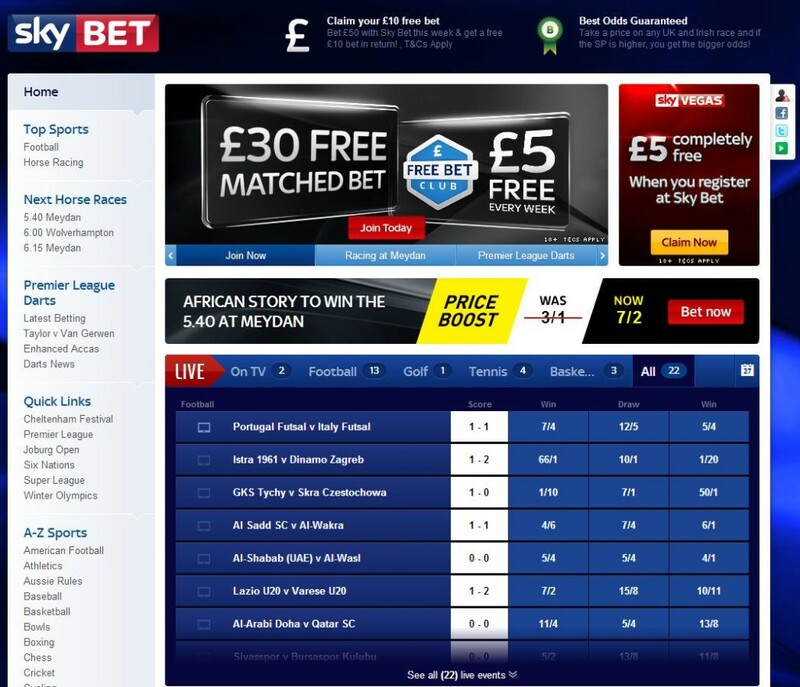 In my opinion, the homepage on Sky Bet isn’t the best. It just feels a little cluttered and I never really know where to start in all honesty. Luckily I have been in this game for long enough to know pretty much where I need to be heading without too much hassle but I can see how people new to the site could find it a little confusing. As with all of these ‘How To…’ type articles, I will be using the football section to talk you through. It’s for two reasons really; one is that I would guess that the majority of you reading will be placing football accumulators and two, it’s the section I am most familiar with. The home page gives you two options to head for us accumulator bettors and these come in the form of simply choosing the sport we want to find under ‘A-Z Sports’ (alternatively football and horse racing are both in the ‘Top Sports’ section) or we can use the Football Coupons section to find the appropriate list. Personally, I love the inclusion of the football Coupons section because it means I can flick between each type of market really easily. The best thing is that even after you have picked a market the Coupon section stays with you in the left hand toolbar meaning you can easily navigate between them, if you so wish. The easiest thing I find with Sky Bet is just simply choosing the UK long list and navigating between each league and cup that’s taking place. The majority of my picks come from these leagues so it suits me down to the ground. If it’s easier, you can select the date in the left hand toolbar then just click the league you want to pick from. The long list offers you with three simple selections from each game, which is home win, draw or away win. They work left to right, so home first, draw middle and away right. You can also choose from additional markets by clicking the arrows pointing down at the end of each row. To make your selections all you need to do is click on the team, result or price that you want to include in your accumulator and they will automatically be added to your bet slip. When they are successfully included, a little blue tick will appear next to your selection. The Sky Bet bet slip is actually one of the most unique in the industry as it pops up at the bottom of your page. I love the fact that it stays with you throughout your time on the site as long as you have selections made. This means that if you want to jump between markets then you can do without losing your current selections. The bet slip is really easy to use and once you have made your picks you will be able to see the accumulator row at the bottom of that slip. This will include the amount of selections you have chosen, the odds in which you will receive and an area for you to input your stake. Once your stake is in, the returns will be amended as to how much you are set to win. Remember that you can add and subtract selections from the bet slip at any time.